SAN JUAN COUNTY – The San Juan County Sheriff’s Office is asking for the public’s help in solving two theft cases. The Sheriff’s Office posted on its Facebook page Thursday that it is on the lookout for a truck believed to have been involved in a theft at Hovenweep National Monument, as well as a horse trailer stolen from the lower Montezuma Canyon area. Both thefts occurred Sunday night. At Hovenweep National Monument, a cash box for the camping area was stolen. A two-tone maroon-and-silver-colored truck, possibly a Ford, was seen in the camping area, once at 6 p.m. and then again at about 9 p.m. The Sheriff’s Office believes two individuals seen inside the truck may be responsible for the cash box theft. “They cut the lock off the outer box and stole the cash box inside,” the Sheriff’s Office wrote. 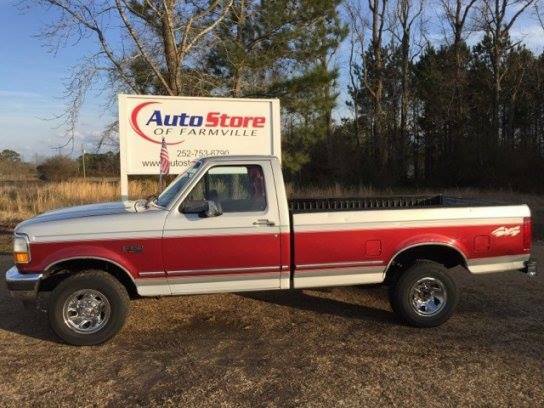 The truck is described as an older model – possibly a late ’80s or early ’90s style Ford. It has chrome tubular rails along the bed of the truck and a chrome toolbox in the back. The paint is a shiny, sparkly silver and maroon. It also has a louder exhaust system and may have Colorado plates. “We believe this vehicle and the two suspects inside were involved in stealing the cash box,” the Sheriff’s Office said in the post. The truck pictured in this article is an example of what the truck looks like, according the San Juan Sheriff’s Office, and is not the suspect vehicle. The second theft Sunday night involved a horse trailer stolen from a rancher in the lower Montezuma Canyon area. The trailer has damage to its left front side, due to a previous accident, and also has damage to the rear right door, which is bent and bulges out. It has four fairly new tires on it that are a HIFLY brand, size LT235/85R16. The tread has an X-style on the outer edge. Anyone with information regarding these theft cases is asked to contact the San Juan County Sheriff’s Office at 435-587-2237. Those contacting the Sheriff’s Office may remain anonymous.